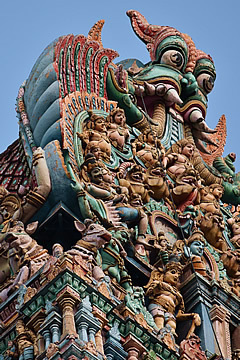 The huge Meenakshi Amman Temple is spectacular, with massive colourful, carved gopuras outside and an atmospheric experience in the dark labyrinthine interior amongst the hundreds of worshippers. 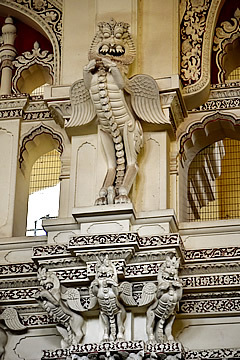 The palace is also well worth visiting for its own fabulous sculpture and impressive halls. 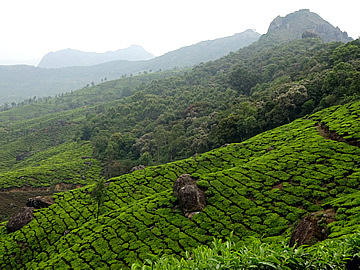 There's something vaguely Japanese about these tea plantations, studded with large boulders. 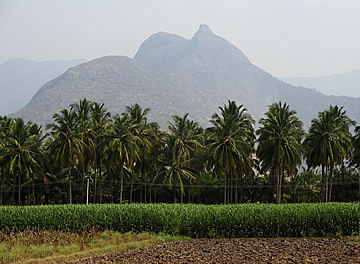 It was going to be a long and quite difficult drive to Madurai from Munnar so we started at 7:15 , supplied with a packed breakfast from Windermere Estate where we had been staying. 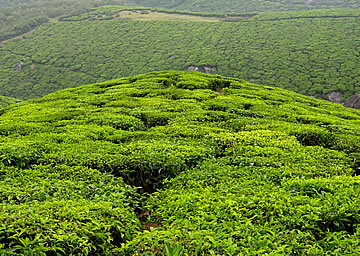 We began with a climb up into the tea plantations. It was a lovely morning and, despite the concern to make good time, we got out of the car and walked a little way up the road. It was very peaceful and the landscape just lovely. 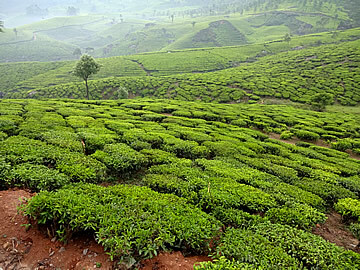 Early morning in the tea plantations of the Western Ghats. However, we very soon came to roadworks, massive roadworks, where the facilities for traffic to get through were minimal at best. The road became nonexistent so that we were driving on rubble and mud. Only one-way traffic allowed so we made very slow progress. Das then took a detour, which looked much shorter on the map but was a poorer road, only single lane, going through villages, so we kept getting stuck behind buses. At one of the villages, which we understood was Das's home village, we stopped and he picked up a bag of tree tomatoes from one of the houses - presumably his or a relative's. In the first two hours we covered maybe 40 km but as soon as we hit Tamil Nadu the roads improved immensely and we picked up speed. 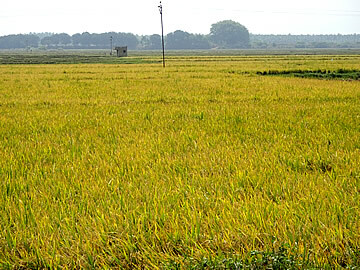 Plains of Tamil Nadu - a great contrast to the tea plantations of the Western Ghats. 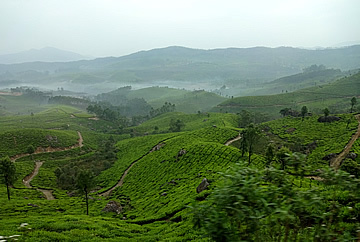 Coming down on the east side of the Western Ghats we must have descended easily 1500m on an amazing switchback road. 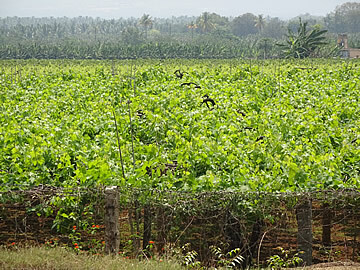 Spread out in front of us were the plains of Tamil Nadu,covered with coconut groves, sugar cane and palm trees. It was a misty morning here and the mountains loomed above us, dropping steeply to the immense flat plains below. 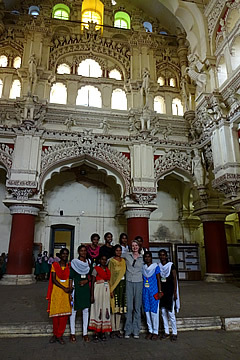 We reached our hotel, the Heritage Madurai, at around 12:15 so the five hours estimated travel time was pretty accurate. 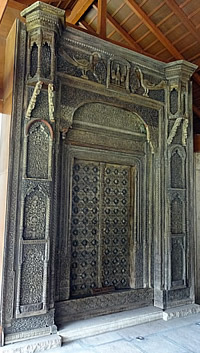 The Mayur Dwaar, or Peacock Door, in the hotel lobby is over 300 years old and once graced the entrance to a fort. 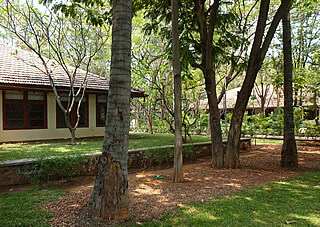 The rooms are all in widely spaced bungalows in shady grounds - ours is on the left, also below! 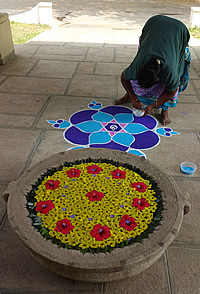 Creating a pattern with coloured sand at the entrance to the hotel. 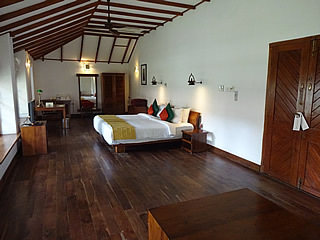 It's a beautiful hotel, very spread out in tree-shaded grounds, with the rooms housed in bungalows spaced around lawns. While we were there a judges' conference was taking place and the hotel was swarming with police. 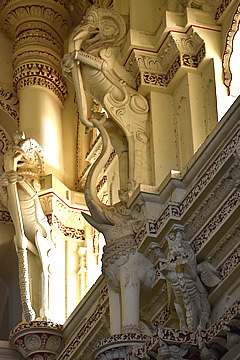 The hotel's core was once a club for employees of the Coats textile company. It has been substantially, but sympathetically, enlarged over several acres. Our room (a luxury villa!) 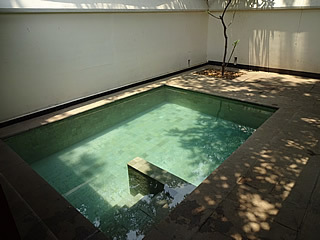 was enormous, with a bathroom to match and plunge pool. The air con in the room was terrific but there was none in the bathroom which quickly became stifling. Though we'd been enjoying the local food we were pleased to see some European dishes on the menu for lunch - fish and chips would you believe! 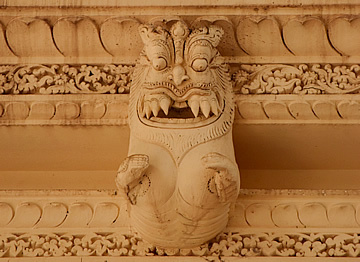 Dinner at the Heritage madurai. Chutneys are quite different to what I'm used to. 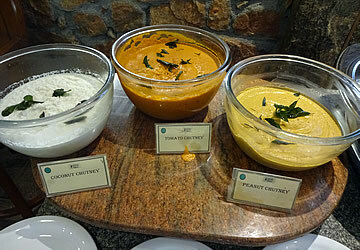 Here coconut, tomato and peanut, served with the traditional breakfast, they are of a thick, creamy consistency. Back to curries for the evening meal, keen to try the Tamil versions, preceded by a truly excellent gin and tonic in the bar. We had a very good mutton biryani - the manager brought over a dish of a spicy red sauce which he said would be very good with it. There was also a raitha but very different to what I've had before, being full of chunks of onion. 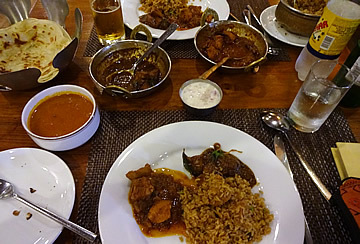 A Chicken Chettinad was also good, cooked in Karaikudi spiced gravy. The south Indian Paratha wasn't quite as good as the paratha we'd had at the Taj in Kochi. A plan of the original extent of the palace, 900m x 660m. The sections outlined in red are what remain today. 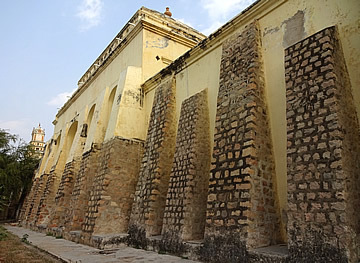 The substantial walls of the palace. 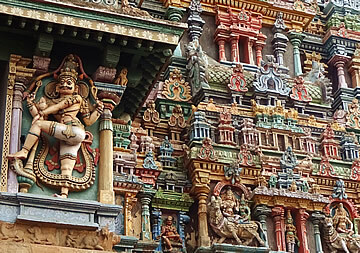 Madurai is over 2,000 years old, built on trade with countries as far afield as Greece, Rome and China, especially in precious silk, pearls and spices. 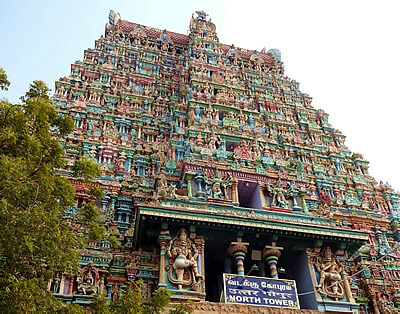 It became very rich and was the capital of the empire ruled by the Pandyan dynasty for over a thousand years until its fall at the hand of the Chola dynasty in the tenth century. 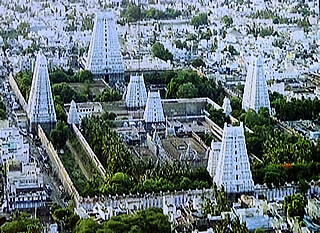 The Pandyans returned in the 13th century and again made Madurai their capital. 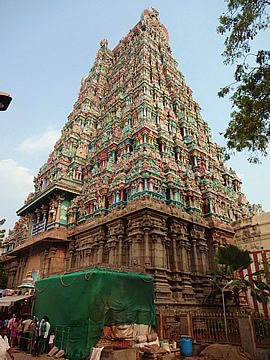 Madurai became an independent Sultanate in the 14th century and then became part of the Hindu Vijayanagar empire when Nayaks became governors. 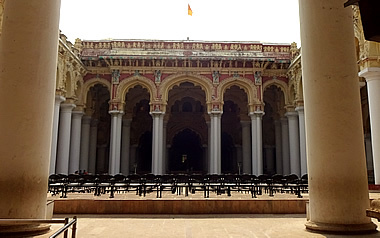 The Nayaks asserted their independence in the 16th century and rebuilt the city, including the construction of the Thirumalai Nayak Palace in the 17th century - Thirumalai Nayak ruled from 1623 to 1655. 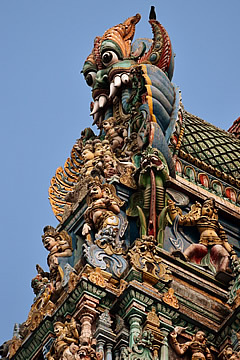 Mythical creature called a yali standing on an elephant or possibly a makara - a mythical aquatic creature. 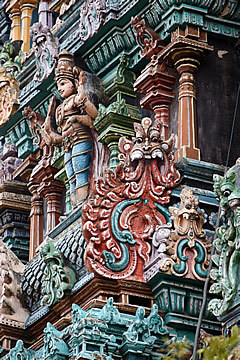 The yali is a typical feature of the South Indian style of architecture called Dravidian. Strong Islamic influence here in the beautiful arches and dome. 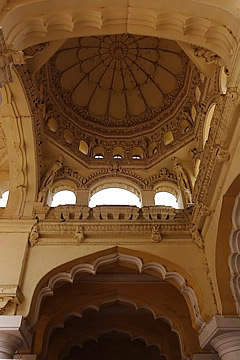 Only a quarter of the palace is still standing, but what remains is beautiful. 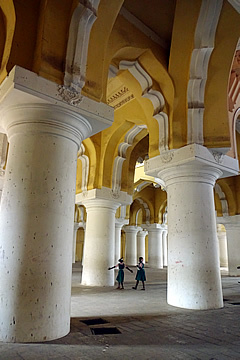 It has many influences, especially with an Italian architect giving it round columns, but also Islamic and possibly even Chinese. In classical Greek moulded decoration we would expect to see egg shapes in these horizontals, here they look very much like stylised hooded cobras. 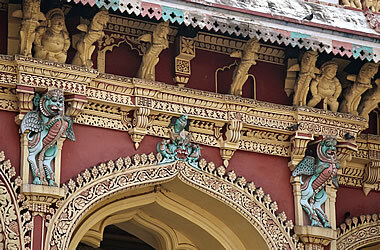 Originally the palace had two residential sections, a theatre, a temple, harem, bandstand, armoury and gardens. 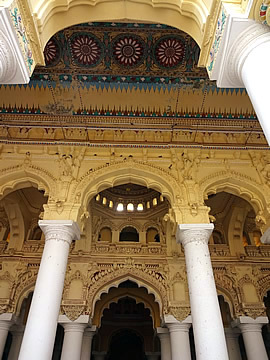 It was dismantled by a grandson of Thirumalai to build a new palace and it was the governor of Chennai, Lord Napier, who had the remains of the palace renovated in 1858. West end of the Swargavilasa from the main entrance. 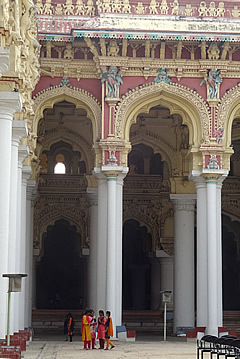 The main entrance is on the east side and the Swargavilasa (Heavenly Pavilion) makes a stunning first impression, a huge rectangular courtyard surrounded by 18m high colonnades. 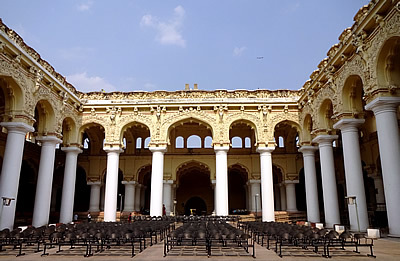 This type of colonnade surrounding a courtyard is a classic peristyle, an architectural style of ancient Greece and Rome, but the arches above it are recognisably Islamic in influence. 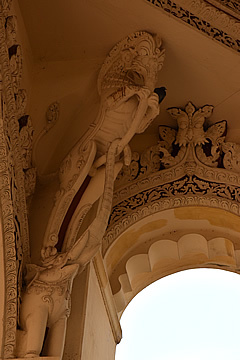 There are some of the most wonderful mythical creatures decorating the arches. 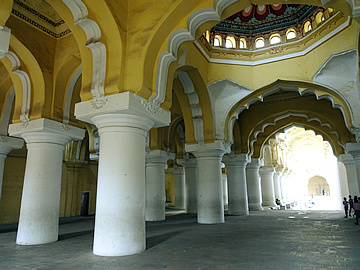 The long hall west of the west colonnade. A room off the Throne Room. 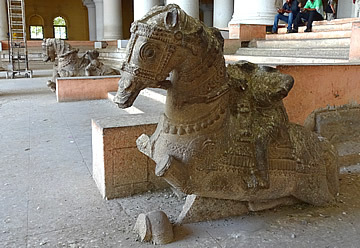 In the west colonnade a set of steps flanked by stone horses and riders lead up to a long hall and into the vast pillared Throne Room or audience chamber. 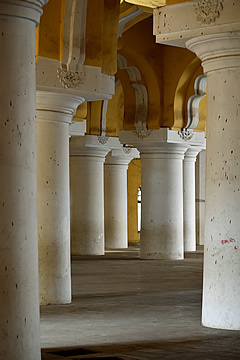 Just inside the west colonnade. 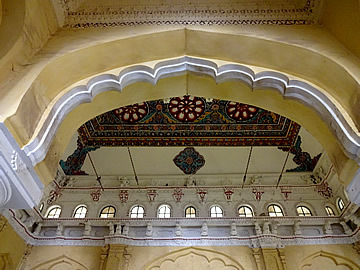 Detail of the long ceiling painting in the west colonnade. 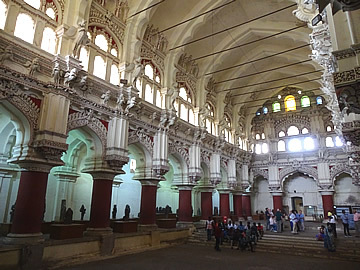 The Throne Room is a mass of squat pillars and contains a replica of the throne of Thirumalai Nayak in the central domed octagonal space. 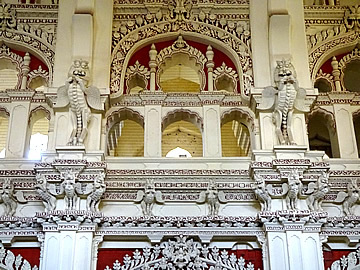 There are rooms off the throne room with fine stucco detail and beautiful ceilings. 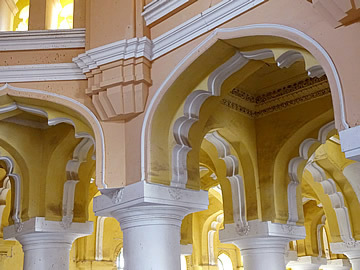 The Throne Room's central pink-walled octagonal space is surrounded by a sea of pillars supporting yellow-painted arches, delicately ogee in shape. Mobbed by schoolgirls in the Dance Hall! Heading north from the Throne Room we entered the Dance Hall, another vast space where the king and his wives would watch dances performed. Here we were mobbed by a school party, the girls all wanting to have a photograph taken with me, then the boys joined in with Andrew. They kept us there for ages with "just one more selfie". Apparently it was because we are pale-skinned and English. We've had this happen in quite a few places but never so intensely. Lovely young people, though, and the girls' outfits put my trekking gear well in the shade! One more of me and the girls, because they were so nice. 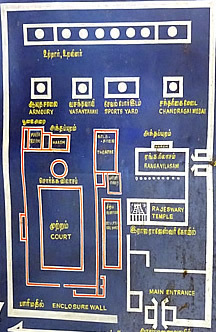 A display in the hotel showing the extensive layout of the Meenakshi Amman Temple. 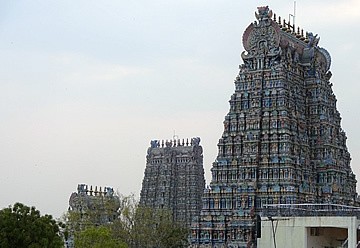 The north gopura, where we entered, is on the right. 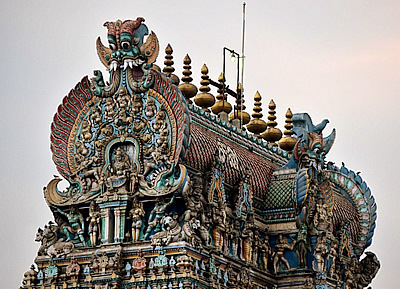 The vast six hectare complex of the Meenakshi Amman Temple was begun during the reign of the Pandyan dynasty as early as the 7th century AD, but much of what we see today was constructed during the Nayak period. 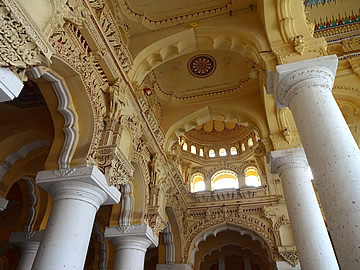 It is one of the most stunning pieces of architecture in Indian, rivalling the Taj Mahal for impact, though in a style that could not be more different. 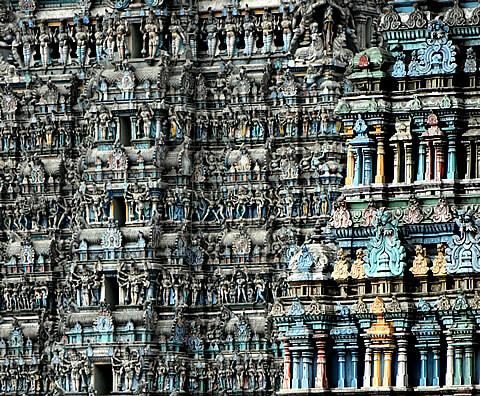 Where the Taj Mahal is restrained, elegant, graceful, peaceful, the Meenakshi is exuberant, wildly colourful, teeming with life. 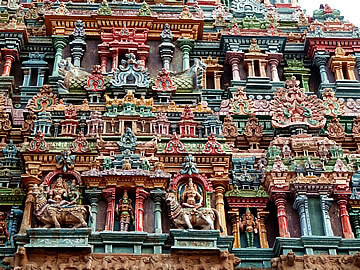 The complex has twelve gloriously colourful gate towers or gopuras. The four largest, around 46m high, punctuate the 6m high perimeter wall. 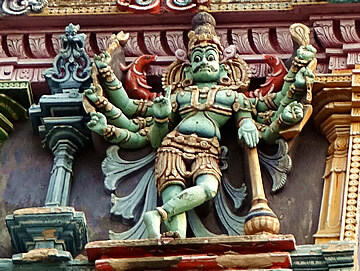 Every square centimetre of the gopuras is covered with carvings of multi-armed gods and demons, dancers and animals. 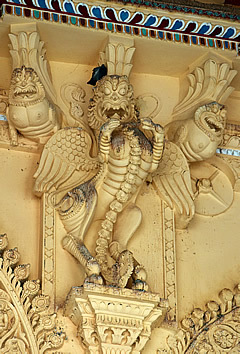 Three of the tallest and two lesser gopuras seen from the roof of a nearby shop. 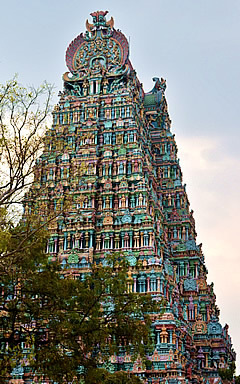 After removing our shoes and leaving our belongings we entered via the north gopura and walked around the west and south sides to the entrance, bare foot and without cameras as no photography is allowed. 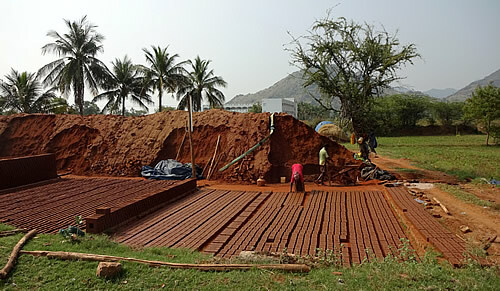 It was 38°C and the sunlit ground was scorching. There was a path marked but where this was in sunlight I tried to avoid it - it was just too hard on the feet. Inside it was dark and we made our way to the beautiful carved entrance to the temple proper and its shrines, covered in hundreds of small oil lamps which were being lit by two attendants on ladders when we went in. 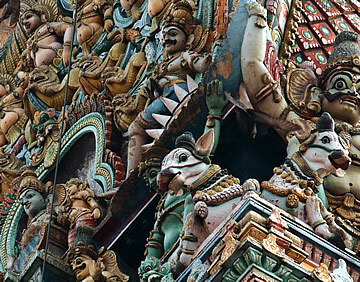 Inside it is dark, columned, and full of carvings of gods in their different guises, temple dancers and animals - elephants and mythical creatures abound. 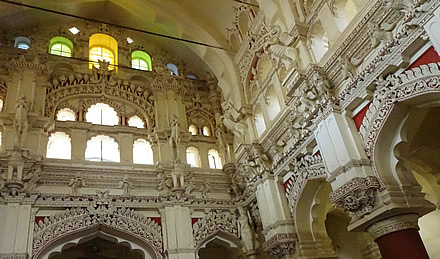 The ceilings and upper reaches of the carved walls are vividly painted. People were continuously entering and leaving, almost all those coming in carried an offering - there are many sellers outside. The offering is often a basket containing, among other things, a banana flower as a symbol of fertility, and a small coconut. 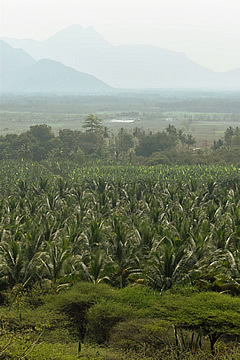 When the banana finishes fruiting it dies, but from the base 1,2 or 3 new plants grow; these in turn fruit and die with more plants growing from the roots in a continuous cycle. 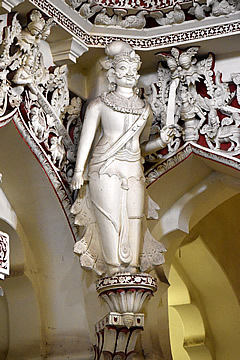 The small coconut is split by a priest who tells what the future holds for the devotee from what he sees inside. Many, many local people were here, performing puja (worship) at the multitude of small shrines. Thousands of wicks burning in tiny bowls of oil provided almost the only source of light, hundreds of them in trays set before the shrines. There had been a fire which had closed part of the temple and it was being blamed on one of the small shops just outside; with so many oil lamps here there must be a huge risk of fire at any time. 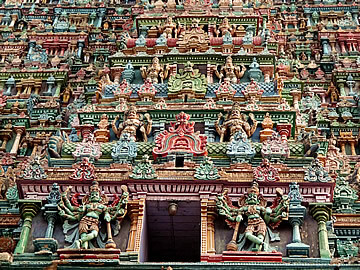 The temple's main shrines are to Sundareswarar (Shiva) and Meenakshi - a manifestation of Parvathi, Shiva's wife. 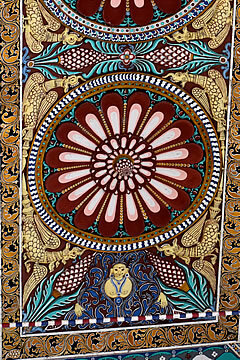 The name "Meenakshi" seems to have some relationship to fish, often interpreted as "fish-eyed" - this was a compliment as fish eyes were regarded as large and bright. 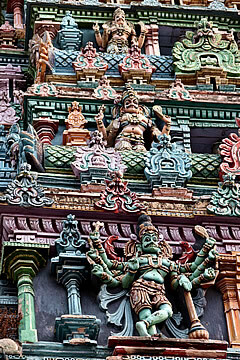 The temple is unusual as Meenakshi takes precedence over Shiva and is always worshipped first. 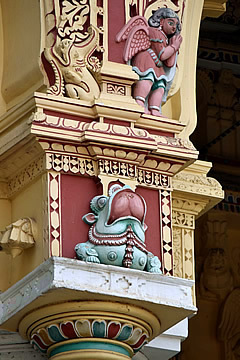 Carvings on the west and north gopuras, seen from the rooftop of a nearby shop. Early evening hence the blue cast; in reality the gopuras are vividly colourful. 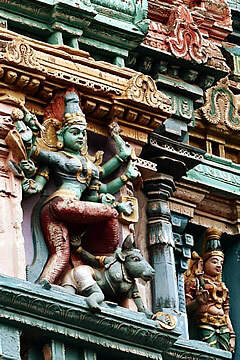 Parvathi and Shiva feature strongly, as you would expect, in the carvings inside the temple, vertically divided with Shiva on the right and Parvathi on the left. 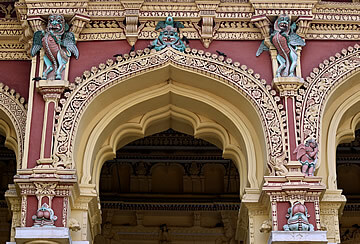 There are many carvings of Nandi, the bull which is Shiva's mount, and Ganesh, the elephant god, too. 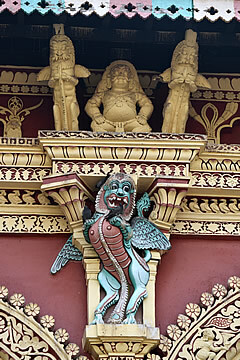 There is a prominent shrine to Ganesh, the son of Shiva and Parvathi and the god of good beginnings. 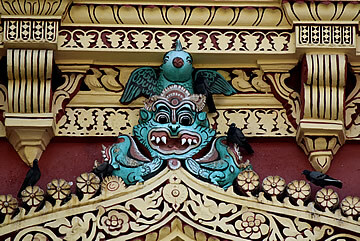 Devotees perform a curious ritual here, bobbing up and down and touching their ears. We spent a good deal of time wandering through the temple, it was absolutely absorbing to watch as families prayed at any one of many small shrines, or a bell energetically rung and a priest suddenly making an appearance amid much fuss, accompanied by attendants with cymbals and chanting. Some parts of the temple were very busy, others practically deserted. There is a huge open air tank, "Tank of the Golden Lotuses" surrounded by steps leading into the water where devotees perform ablutions. 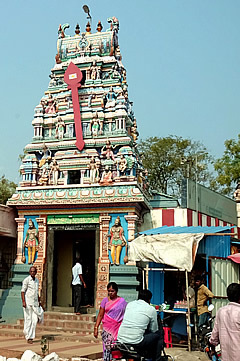 At a shrine with a figure of Nandi there is a tall golden pole with reliefs on it which stretches up through the ceiling - a flag is flown from the top when there are ceremonies in the temple. I don't think I saw another tourist here, though a few obviously get here. 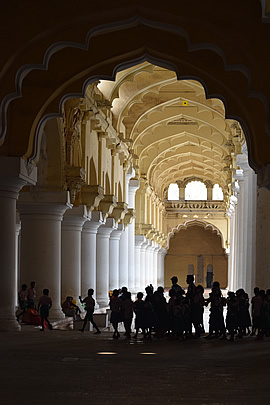 It was just full of local people, families, probably people who had travelled some distance too, making their devotions, praying to their particular divinity - thousands visit every day. This was an incredibly atmospheric experience, probably my highlight of the whole trip. My impressions are so vivid that I was convinced I must have taken photographs, but of course I hadn't. 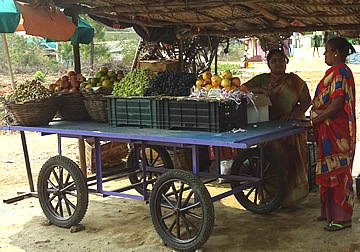 Baskets of fresh fruit including black and green grapes. 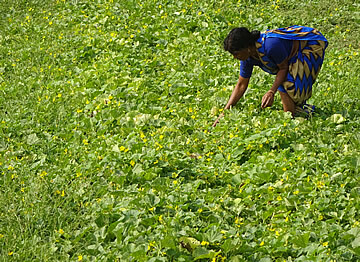 A woman looking for ripe cucumbers. 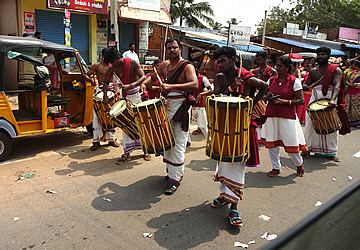 We left Madurai early for the drive back into Kerala and Periyar. 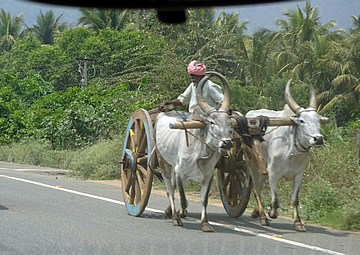 Fortunately all but a short final stretch were in Tamil Nadu - as soon as we crossed into Kerala the roads deteriorated. 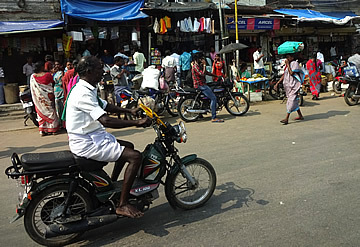 There were fascinating scenes of daily life along the way. A couple in their (?) 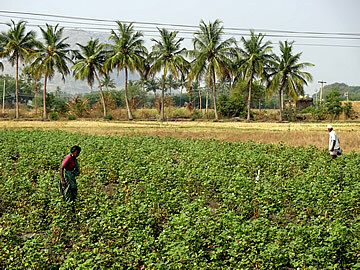 cotton field. Almost all men wear a dhoti, these are the coolest form of clothing for a climate that can be intensely hot. 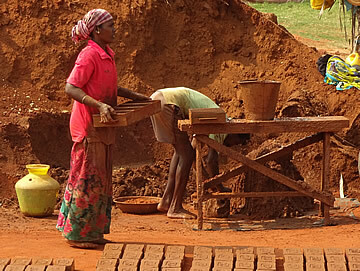 Feet are often bare, loads most comfortably carried on the head. 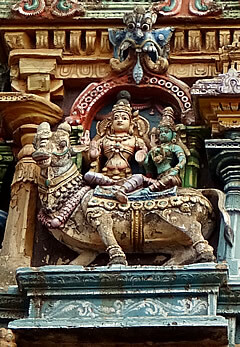 We saw quite a few shrines, some with fabulous horse sculptures.